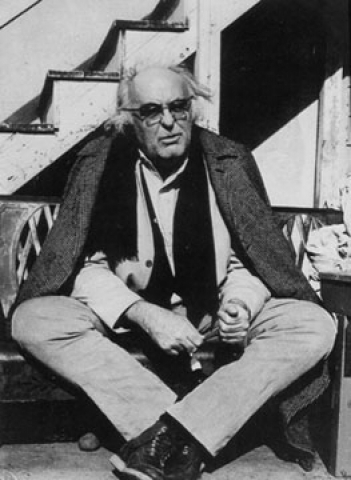 Charles Olson at home in Gloucester. Photo courtesy of Gerard Malanga. 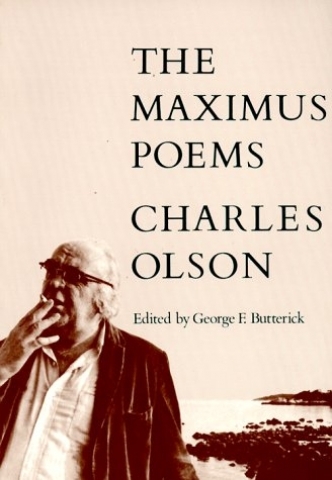 Charles Olson was an acclaimed poet who lived in and wrote about Gloucester. He is considered one of the major poets of the 20th century, and had a profound influence on many contemporary poets, including Robert Duncan, Robert Creeley, Denise Levertov, Allen Ginsberg, Amiri Baraka, and Ed Dorn. Olson studies have continued into the 21st Century, with new discoveries and revised assessments by scholars in the Americas, Europe, and the Far East. Ralph Maud (1928-2014) was a colleague and friend of Charles Olson, and a leading authority on Olson’s life and work. Maud was interested in the sources of Olson’s poetry, and undertook the ambitious task of identifying and collecting a copy of every book Olson had ever owned, read, or referred to. His book Olson’s Reading is a key text in Olson studies. By the time of Maud’s death, his collection of Charles Olson source materials had grown to 3100 copies of books that Olson was known to have owned, read, or referred to. According to Maud’s wishes, the collection is now entrusted to the stewardship of the Gloucester Writers Center, and is housed at 108 East Main Street, in Gloucester. I remember clearly coming to Gloucester for the first time, in the spring of 1996, and being welcomed to dinner by Ralph Maud in the restaurant Gloucester House, where he sat at a table with several other people who, like me, had come to spend a few days on his “peripatetic tour of Charles Olson’s Gloucester.” While I don’t entirely remember or understand what happened in the twenty years between then and now, that initial encounter was the beginning of a chain of events that culminated just a few months ago in the installation of the library dedicated to “The Ralph Maud Collection of Charles Olson’s Books” at 108 East Main Street, a few doors down the street from the Gloucester Writers Center, overlooking the harbor. I think it’s safe to say that I looked forward to visiting the Gloucester of Charles Olson under the guidance of Ralph, who was a preeminent Olson scholar, as a means of orienting myself, getting my bearings at a complicated juncture in my life—as I was emerging from the post-doctoral crosscurrents of my research as a comparatist in the disciplines of literature and archaeology, living with my wife in lower Manhattan with three sons under the age of twelve (including twins), and contending with my work in the Greek-American shipping business as a player in a multi-generational partnership between two families (i.e. between two father/son “teams”), an asymmetrical partnership that was breaking apart under acrimonious circumstances. All of it together was taking its toll on me, as I struggled also to maintain a long-standing commitment, as a writer and poet, to the field of so-called radical poetics. At any rate, it was in the Spring of 1996 I first discovered Gloucester: visited 28 Fort Square; looked out from Olson’s former bedroom window onto Ten Pound Island; dropped in on poet Vincent Ferrini at his home on 126 East Main Street (now the home of the GWC); walked through Stage Fort Park; hiked around Dogtown; and, though neither they nor I can recall it precisely, first met Henry Ferrini (who showed us an early version of his Olson film Polis is This), Greg Gibson, Gerrit Lansing, and others… all those who, over the years, have become my Gloucester compadres in and around the GWC. So it was as much Maud’s work as a scholar as it was Olson’s work as a poet that initially drew me to Gloucester, and then, more strangely, continued to draw me back there from my home in Greenwich Village. Indeed, for starters that’s how I would describe the Maud / Olson Library : as a local Gloucester monument to the “marriage” of poetry and scholarship. After that first meeting in Gloucester I visited Ralph in Vancouver a few years later. Naturally, we discussed Olson. It was at that time (1998-99? ), in Ralph’s home, that I first saw the installation that is the facsimile library of Olson’s books. I have to assume that at some level the confluence, on one hand, of working in the field of maritime transportation, and, on the other hand, immersing myself as poet-scholar in the writings of Olson—who took the seaport of Gloucester (le Beau Port) as the matrix of his epic Maximus poems—drew me to Gloucester and led me, beyond Olson, to Ralph Maud. Similarly, however, I think it was Ralph’s slightly off-the-wall project of collecting replicas of Olson’s books, re-copying Olson’s original annotations therein and gathering the books into one room that compelled my returning to Gloucester, to Olson, to Maximus. I know that when I first approached Olson (by way of Guy Davenport’s The Geography of the Imagination), what struck me was the extraordinary constellation of book-length studies devoted to his work, all of which had appeared in the relatively short time since his death in 1970 (books by Charles Boer, Don Byrd, Charles Stein, Robert von Hallberg, et al., in addition to the dedicated scholarship of George Butterick, including notably his Guide To The Maximus Poems). I say this because it seems to connect with something that Ralph said to me early on—viz. that if I pursued the study of Olson I would meet good people along the way. His prescience has since proven remarkably accurate, as if he knew something that I had yet to understand, something about the “scholar’s art” toward which his replica library pointed, and continues to point. However, it is as if Ralph’s duplicate collection of Olson’s books had a life of its own, not simply as an Olson source library, but also as its own instance of a “scholar’s art,” a conceptual art installation—in the tradition, say, of Duchamp’s “Le Grand Verre” (or, closer to home, “The Broken Kilometer,” displayed in a Soho art gallery since 1979)—an art installation designed to highlight Olson’s library as a space through which and around which a community or “polis” might come to life. That is what I see in Maximus, just as I see it in “The Ralph Maud Collection of Charles Olson’s Books”: an open invitation to enter a growing and evolving network of texts that would cohere as social body—as the theoretical social body represented not only by the collective figure that is “Maximus” in the Maximus poems, but also by the conceptual space that animates the Maud / Olson Library (Maximus “de-constructed” ?) as art installation. As it turns out, in the few years’ interval during which Ralph had presumably decided on Simon Fraser as the eventual home for his collection, the house of Vincent Ferrini, who died toward the end of 2007, became available for sale. Largely at the urging of retired UU minister Paul Sawyer, who was struggling with cancer, the idea of acquiring Ferrini’s home and transforming it into a writing center under the twin aegis of poets Ferrini and Olson, started to catch on. Being in a position at that time to help finance the project, as part of a larger fund-raising effort that drew quick and extensive support, I became a co-founder, together with Henry Ferrini and Annie Thomas, of the Gloucester Writers Center. We acquired Vincent Ferrini’s humble lodgings in May of 2010—in time for Paul Sawyer to see the center come to life there soon after, before he finally succumbed to his illness. The GWC officially opened its doors to the public later that summer. I always kept Ralph Maud’s original idea in mind. And my interest, as part of the GWC, was in establishing an institutional foothold for a not-for-profit arts organization that would allow energies to coalesce around Olson’s work. Olson himself had dreamt of getting Gloucester to “cohere” socio-culturally, and to disseminate that coherence nationally, even globally, by virtue of the force inherent to the discourse of “projective verse.” In its own small way—in line nonetheless with Olson’s vision—the remarkable success of the GWC in the years since its foundation points to the fulfillment of a need for community that the focus on the art of writing provides. With the GWC’s growing success, it also became evident that the GWC was fundamentally well-positioned to accommodate Maud’s archival monument to Olson’s intellect (L. legere = “to collect”). Ralph, for whatever reasons, took a while to see that in serving Gloucester the GWC was also serving Olson, but as the annual Charles Olson Lectures continued for an appreciative audience each Fall (with talks by Diane di Prima, Iain Sinclair, Anne Waldman, Amiri Baraka), his turn logically came up, and, when it did, he was glad to oblige. He was scheduled to speak at the Cape Ann Museum in October 2014 on the topic “Charles Olson As I Remember Him.” Sadly, Ralph never made it back to Gloucester; he died in Vancouver on December 8th. But about nine months later, his Olson Library would make the trans-continental journey for him. I went to Vancouver a few weeks later, in January (2015), to meet Alvina and discuss the transfer of the Olson Library with Ralph’s lawyer for the estate, Sean Hern. It was helpful to have Miriam Nichols there too. I had met her the previous summer when she came to the GWC to speak on “The Significance of Mythopoesis in Olson’s Later Maximus Poems.” The meeting at Alvina and Ralph’s home, coming barely a month after Ralph’s death, was uneasy for all of us. Despite Ralph’s expressed wish, it was not immediately obvious what the fate of the Olson Library would be; specifically, the question was raised whether the books didn’t rightfully belong in Vancouver, in the library at SFU. That wasn’t what Ralph had led me to believe, but then again I didn’t really know what had transpired between Ralph and SFU concerning the placement of his collection. At some level, I still don’t. These fifty-three volumes have now joined on my shelves the approximately 4000 volumes and pamphlets and periodicals which represent two decades of an attempt to replicate Charles Olson’s library. About 85% of Butterick’s list has now been acquired from the secondhand bookshops and catalogues of the world. I have gone further, collecting the works of Olson’s contemporaries omitted from the ‘preliminary report.’ Moreover, although Butterick was excellent in deducing Olson’s use of certain books from allusions in his poems and essays, I have been able to add to these conjectures in significant ways. Thus the Storrs collection, limited to what Olson had retained at the time of his death, is not as comprehensive as what is attempted here. The “preliminary report” to which Ralph alludes, and which he further brings to light in his introduction to the catalogue (Minutes #64/65/66) several years later, is the “Preliminary List” compiled by George Butterick—Olson’s former student, and the curator of the Literary Archives at the University of Connecticut at Storrs during its acquisition of Olson’s actual books [Charles Olson Library.webloc]. Butterick had not only catalogued the books, but also was able to supplement them with “many titles known and used by Olson, though not in his library.” In one respect, then, Ralph’s project can be traced back to the early 1970s, and can be said to have drawn impetus from work started by George Butterick. As indicated on its website [SFU Library Special Col#100EE2C], the 18,000-volume Contemporary Literature Collection at Simon Fraser “is almost as old as the university itself.” While the website does not mention Ralph Maud by name, it makes clear that the creation of the CLC is coincident with the beginning of Ralph’s tenure there as a member of the English Department which, in 1965, “had received a grant along with a commission to compile a bibliography of avant-garde magazines.” Moreover, the grant stipulated that the department “was to begin building a special collection comprised of little magazines, pamphlets, chapbooks and ephemera representing modern literature for the period 1945-1965, with an emphasis on poetry.” Indeed, as Tony Power, the librarian for the CLC recently confirmed for me, not only was Ralph the first hire in the English Department at SFU, but he was drawn there by the possibility of starting and curating this collection. Ralph acquired the books that constituted the “nucleus” of the CLC until, according to the library’s website, “in the early seventies [i.e. in the wake of Olson’s death], the English Department and the Library agreed on a policy to guide the development of the collection,” with reference to quotations taken from the writings of Pound, Olson and Williams. Many of the original first editions listed in Ralph’s catalogue were ordered at this time by Ralph for the benefit of the CLC. His Olson library could thus be described as a project that began around the time of the creation of the CLC, a project that gathered momentum and amplitude in the aftermath of Olson’s death, as the books catalogued by George Butterick became archived at Storrs and Ralph began the process of buying duplicates thereof. In effect, the Contemporary Literature Collection and Ralph’s Collection of Olson’s Books are co-extensive. The two “components” of Ralph’s collection of Olson’s books include, respectively, the books he bought for Simon Fraser on behalf of the CLC and the replicas of the archived books at Storrs, which he collected in his studio and supplemented with “original” books he acquired later. These two component parts continued to exist side-by-side throughout Ralph’s lifetime (some 80 of Ralph’s Olson books were bequeathed to the CLC at the time of his death), as if the latter were meant to underscore Olson’s foundational status within the former. Arguably, moving the books from Ralph’s studio in Vancouver to the shelves of the Maud / Olson Library in Gloucester does not really change the design or “architectonics” of the collection. The 560+ mostly original-edition Olson books in the CLC are of greater bibliophilic value, consisting not only of rare small magazines, pamphlets, chapbooks, etc. , as well as books signed by Olson, but also of first editions (many either inscribed to or annotated by Olson) of works by leading figures in contemporary poetry, principally the “Black Mountain” poets and others anthologized in Don Allen’s The New American Poetry. The 3700+ Olson books now in the GWC’s Maud / Olson Library—as these continue to be catalogued and entered into a working database (notably, through the good services of Judith Nast)—are, on the other hand, mostly copies of those books that crossed Olson’s desk in the course of his research. What I think gets expressed as a sort of side effect by the international, trans-continental transfer of the Maud / Olson Library—as if drawn backward along an archaic North-West path of human migration—is Maud’s and Olson’s shared sense of “projective size.” By probing the archaeological depths of Gloucester in the Maximus poems (before the American moon landing, before the famous photograph of Earth seen from space), Olson elaborated a poetics that proposed an ecological view of planet Earth as a single geo-historical entity. This is his originality, the reason a scholar like Ralph would want to build a monument to the man. Olson’s frame of reference was a global environment in which the migration of humanity out of Africa along the East Africa Rift, and the advance of Western civilization from the Sumer valley, across the Mediterranean and Atlantic oceans, to Gloucester and the American West, expressed an expansionist flow of human energy moving North-West across the surface of the planet, against the background of shifting tectonic plates. The quasi-gravitational pull toward the Arctic Circle pointed to the succession of the Ice Ages as the human measure of time in a “human universe.” With Maud / Olson in the back of the truck, Henry and Gregor drove back across the ages toward Gloucester, with Mesopotamia on the horizon. Sitting at Olson’s desk, looking out through the window at Gloucester harbor, with City Hall and Our Lady of Good Voyage in the distance, one can appreciate the charming irony that the Maud / Olson Library in its current location actually faces North-West—i.e. roughly speaking, faces Vancouver, B.C.. Its point of origin there lies across the continent, in another country, on a global line-of-flight of mythopoetic significance. I might also reference the 1963 Vancouver Poetry Conference, which was unequivocally hospitable to Olson, and was the precursor event for the 1965 Berkeley Poetry Conference. Olson played a central role at both these events, but it was at Berkeley that Olson’s “performance” revealed the poetic will-to-power behind “projective size,” and made clear his conviction that poetic discourse has a rightful place at the discussion table in the world of geo-politics. At some crucial level, “projective size” describes the contention behind the claim that poetry matters in the management of national and international affairs. At the Berkeley conference (which Ralph Maud attended), Olson made clear the scope and ambition of his poetic agenda. During his talk at Berkeley, he mentioned President Kennedy, who in a 1961 speech had alluded to Puritan John Winthrop’s 1630 sermon to the future Massachusetts Bay Colony (“…I have been guided by the standard John Winthrop set before his shipmates on the flagship Arabella…”). As if picking up on Kennedy’s reference to Winthrop’s so-called “City upon a Hill” sermon (based on Matthew 5:14), Olson said: “… from my point of view, cannot quote Mr. Winthrop right, when Mr. Winthrop said… ‘Let man live in a city,’ meaning a society, ‘which shall shine as a city does upon its hill,’ or something like that , but… That is my dream, of creating a city, which shall shine as such. And this is only what I am, is the builder of that dome” (as transcribed in Muthologos I, 102). The building of “a city which shall shine as a city does upon its hill” can be taken as a dominant theme of the Maximus poems. This ambitious “dream” of Olson’s is restated in the first poem of the third, posthumous volume of the Maximus poems with the line “to write a Republic.” As Butterick writes in his notes to the poem, Olson commented on what it might mean “to write a Republic” in a letter to Ralph Maud (Aug. 1966): “… that a poet, or a man who would in fact write a republic (still so far as I can ‘hear,’ the real word for politics—res politius populus puberte public… [the contrast is Aristotle, isn’t it—his ‘Politics’?! ].” In this respect, one could interpret the reconstruction of Olson’s library as an image for the “shining light” in a city on a hill (polis), where poetry wields legitimate authority in matters of government. The very same poem, however, is also the site of “gloom”—another, increasingly salient theme in the Maximus poems, especially across the third volume: “having descried the nation / to write a Republic / in gloom on Watch-House Point.” From a different perspective, the Maud / Olson Library could be said to stand for the same “Watch-House Point” of Maximus’s gloom: the NW vista extending outward to Vancouver no longer a hospitable site with mythopoetic resonance, but a place that points to exile and marginalization for Olson and Olson studies. One need hardly be reminded of the irony that the extraordinary scholarly investment in the work of the “New American Poetry”’s leading poet, which the Maud / Olson Library represents, essentially occurred in Canada, over a period of time during which, back in the U.S.A., Olson was getting berated. He continues to be berated in significant ways throughout the poetry circles of American academia. It is not my purpose here to join the debates regarding Olson’s diminishment as they might have played out in Buffalo, for instance, during the late 1980s; these issues have been astutely addressed by poets and scholars such as Michael Boughn, Ammiel Alcalay and Ken Warren. Soon after the boxes were emptied and the books shelved, I was alone one evening in the Maud / Olson Library, when I experienced something weird, later elucidated for me by a passage I came across in Susan Howe. What I felt that evening in Gloucester, and couldn’t quite explain at the time, was a sensory flashback—from the combined effect, I surmise, of the silence, the artificial light, the dust, the writing(s) on the walls—that transported me to an experience I’d had a few years earlier, when I was able to visit the magnificent burial chamber of Queen Nefertari in the Valley of the Queens on the Upper Nile. Exquisitely preserved and admirably curated, the burial chamber of Queen Nefertari (c. 1255 BCE) was unlike any room I had ever in the course of my life been in. I felt very strongly that I was literally in an architectural environment engineered for the single purpose of transporting a human soul into the company of the Gods. Somehow, this memory of Queen Nefertari’s tomb had been triggered in me by simply being in the Maud / Olson Library. In a sense, Olson had come alive for me because of a personal association stemming from my past travels to Egypt. It seemed at the time an intimate experience unique to me. Shortly after this, on Nov. 7th I went to hear Susan Howe speak as part of the Library Symposium at Poets House in NYC. She was in conversation with Nancy Kuhl of the Beinecke Library. Given the coincidence of the program with our own efforts at the GWC to bring Olson’s books back to Gloucester, I talked with Susan Howe about our project. And in leaving the event, intrigued by some of her comments, I picked up her handsome little book, with its evocative title, Spontaneous Particulars: The Telepathy of Archives. What struck me as I read the book, in which she writes about working as a poet with archival materials in research libraries, was a juxtaposition of the words “waste” and “life hereafter” in her comment: “What difference does it make if what we see before our mind’s eye has already been interpreted? This meanly magnificent ‘waste’ exists on a scale beyond actual use. It provides us with a literal and mythical sense of life hereafter.” Reading this, a bell rang in my head. I started to realize that what I had thought was an experience personal to me and my life that evening in Gloucester was rather a “telepathic” effect, “on a scale beyond actual use,” inherent to the nature of archives and their resuscitative power, as Howe had described it. Alone in the Maud / Olson Library that night, it was as if—somewhere between “Watch–House Point” and the “city upon a hill”—I was standing in the presence of Maximus’s mummy, in a sarcophagus built by Olson, in the burial chamber that was Ralph’s Collection, in a scene overseen by Maximus-reborn from an analog point in the Empyrean. I experienced the Maud / Olson Library as a resurrection machine that had suddenly been switched on for me. That’s one way at least of looking at the Maud / Olson Library. Take, say, the “gloom on Watch-House Point,” on one hand, and something like the “shining city upon a hill,” on the other, as given. Consider them the X and Y coordinates of Maximus’s peripatetic wanderings across the greater Gloucester landscape. The art of the Maud / Olson Library can be seen to project those coordinates into the conceptual space of a poetic afterlife. The result, in the hereafter, is that Maximus continues to operate, literally and mythically, as a figure for post-Jungian homo maximus—as shorthand, in other words, for homo sapiens sapiens writ large… Olsonian “Homo Anthropos” (Maximus IV, V, VI, 146) for our own Anthropocene age.